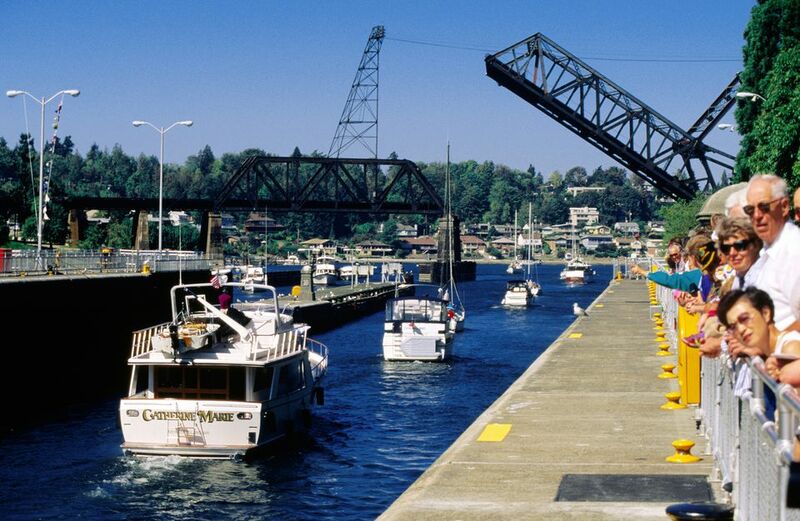 The Hiram M. Chittenden Locks, more popularly known as the "Ballard Locks," is worth visiting for a number of reasons. Located along a waterway, in a parklike setting, near great seafood, a Ballard Locks visit is quintessentially Seattle. Children particularly enjoy watching the Lake Washington Ship Canal locks in operation as they assist boats passing between Lake Union and the Puget Sound. Another highlight is the fish ladder used by salmon to travel upstream to the waters of Lake Washington and beyond. During your visit, you'll find yourself glued to the windows in the fish viewing room. First of all, what's a lock? A lock is a device constructed to allow boats and ships to pass between stretches of water that are at different levels. In the case of the Ballard Locks, it is a water passage that allows boats of all kinds to pass back and forth between Lake Union and the Puget Sound. These particular locks also function to keep the saltwater of Puget Sound out of the freshwater lakes of Seattle. It's fun to visit the locks and watch them in action as the various vessels enter and depart, and as the water level raises and lowers. During your visit, you'll undoubtedly see sailboats and fishing vessels along with other varieties of recreational and industrial watercraft. The Ballard Locks are located in Salmon Bay, just west of upper Lake Union, and are part of what is known as the Lake Washington Ship Canal. This canal connects Lake Washington, Lake Union, and the Puget Sound. The locks are operated by the U.S. Army Corps of Engineers. Boats and ships aren't the only things that pass between Puget Sound and inland waters. Fish, particularly salmon and steelhead, also make use of the man-made route via a fish ladder that is part of the facility. You can experience the large silvery fish making their journey by spending some time peering through one of the underwater-viewing windows, a fascinating experience for all. Please note, the fish ladder viewing area is in the process of being renovated and when it is open again, information will be provided on the locks website. The visitor center provides the opportunity to learn more about the history and operation of the Ballard Locks. Located in a charming historic structure, the Hiram M. Chittenden Locks Visitor Center is open daily from May through September and is open on Thursday, Friday, Saturday, Sunday, and Monday during the rest of the year. Contact the visitor center at (206) 783-7059 if you are interested in joining a 1-hour-long guided tour of the locks. The grounds around the Ballard Locks and the visitor center are home to the Carl S. English, Jr. Botanical Garden, providing visitors with a lovely place to stroll and picnic. Special events, including live music and garden shows, take place on the grounds throughout the summer. Folks particularly interested in Seattle's maritime culture may want to visit nearby Fisherman's Terminal, home of the North Pacific fishing fleet.